Grendizer AKA Goldorak or Goldrake is a very special case as it is the very first Japanese animation series to be very successful in many countries (Quebec, Italy, France, central Europe ...) at the beginning of the eighties. - nearly all the public and private TV channels enjoyed the opportunity and had broadcast almost everyday Japanese animation for more than a decade : until the beginning of the nineties (until the scandal of "hokuto no ken" Affair). Therefore, you understand easily that Grendizer/Goldorak had directly and indirectly a phenomenal cultural impact in those countries. Millions of kids were truly loving it. At that time, songs of Grendizer/Goldorak and themes specific for each country get on the charts and even get several Golden records!! Nowadays, it still enjoy a cult status in many places. Be as it may, what about the anime itself? Created by Go Nagai (Mazinger, Cutey Honey), the anime is a classic super robot anime focusing on the adventure of a team of young heroes struggling against invaders coming from outer space. Sounds like a simple plot full of Manichaeism but it gives the opportunity to develop cunning ploy, funny robot design and original ideas for each episode. Ok Let’s face it, the art is rather outdated by today’s standards. It is fine with me but I do understand it could be an issue for a younger audience. But hey! This was the charm of the Seventies/Eighties! and still thanks to the work of Shingo Araki (Saint Seiya, Lady Oscar) who was the animation director and was involved in the character design, this anime have pretty good art, far better than some seventies or early eighties anime (like Harlock 78 or Ideon). Because many songs was created for different countries’ audiences, depending on which language you speak, the songs could be very enjoyable: good pop/rock heroic style. Note: this is an updated version of a review I did at IMDB. One of my all time favourites! It was between the late 70's or the early 80's. that a certain Anime series from Japan came out of nowhere and quickly won the hearts of Arab children everywhere, that show was UFO Robot Grendizer. Created by Go Nagai who brought us classics such as Mazinger Z, Cutey Honey, Getter Robo and Devilman, the show chronicles the adventures of Duke Fleed, a young alien prince from a now destroyed alien planet who flees to planet Earth, landing in Mount Fuji, Japan. Wounded, he was found by Dr. Umon the head of the Space Science Lab. Taking up the name Daisuke Umon, he began working in a ranch near the lab helping out the Makiba family who reside Shirakaba farm, the family consists of Hikaru Makiba, her UFO obsessed father Danbi Makiba and her little brother Goro. Duke Freed wanted to live a peaceful life, but when he realised that the Vegans, the same alien force that conquered his home planet have selected Earth as their next target, he is forced to use Grendizer, a robot built on planet Freed and which helped escape from his home planet to fight against the Vegan invasion. He isn't alone in his battle, joining him is Mazinger Z protagonist, Kouji Kabuto who unfortunately doesn't use Mazinger in this show. While it can be as seen another campy 70's super robot show, this anime still has some aspects that help it stand. The anime had a little more drama compared to mecha titles of its time, there is also some nice character development and a beautiful music score especially the ones used to give the perfect atmosphere for a tragic scene which occurs a lot in the show. Compared to its predecessors particularly Mazinger Z and Great Mazinger, UFO Robot Grendizer could be seen as having an Anti-War theme as it shows the horrors of wars as Duke Fleed hates war, fighting, and destruction. This was way before anime titles such Mobile Suit Gundam that made such themes a major focus. While not the first anime to feature an alien as its protagonist, it was the first in the Super Robot genre to do so. Mazinger Z fans might be disappointed that Kouji doesn't pilot Mazinger Z in this anime (although he does pilot Great Mazinger in the Grendizer Vs Great Mazinger movie) but he is still an important character, him and Daisuke started on the wrong foot but then became a reliable friend and has helped out Daisuke/Duke when he needed help. Hikaru started out as a usual damsel in distress type of role but eventually becomes a member of the team and gets her own ship and is quite the fighter. Maria, Duke's lost sister appears in the later half of the show then developed feelings for Kouji and was also hinted that he became attracted to her as well. This become a running gag in many Super Robot Wars games as well in the Dynamic Heroes e-click manga that Maria and main female Mazinger Z character and Diana A pilot Sayaka Yumi are rivals for Kouji's attention. The other characters serve their roles quite well, Umon and his crew at the lab serve as the men behind the gadgets as well as Umon plays something of a father figure to Daisuke. Hikaru's father Danbi serves as an entertaining comic relief of the show, who started from UFO freak to a caring father who would do anything to save his family while still being the comic relief. The Vegan empire had a lot of great villains like Lord Vega who is your usual Galactic dictator, but not all of them are pure evil, some do it because of their loyalty to their empire like General Zuril, while others were forced to fight believing that Grendizer was an evil threat to their planet like in the episode when Vegan assigned a group of young Vegans mostly children who were trained to be fight and who were learnt to believe from Vega that Grendizer was an evil force bent on destroying the Galaxy. While did because they were either brainwashed or doing it to save their planets from an Vegan attack. 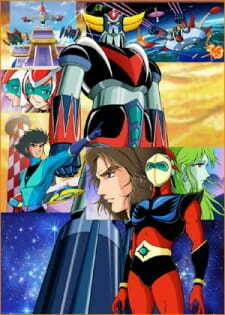 Although not as popular in Japan as Go Nagai's other Super Robot classics Mazinger Z, Great Mazinger and Getter Robo, Grendizer is often credited as one of the major contributors to popularizing Anime in Arabic speaking part of the Middle East as well as Central Europe particularly in France and Italy where it was called Goldrake. I hear it also holds a strong following in the Quebec part of Canada, Russia and Malta. 26 episodes of the anime were shown on American TV as part of the multi-mecha show Force Five. However, it wasn't a big success in the US. One of the many reasons why Grendizer became such an enormous hit in Arabic speaking countries was because it was the first "Serious" cartoon that a lot of Arab viewers have ever seen and something different to other cartoons that were shown at that time like Disney, Looney Toons, Popeye and Tom & Jerry. I recommend this anime to anyone who enjoys a good old fashioned Super Robot entertainment.